This topic explains the steps that you must complete before you install Edge Microgateway as a sidecar proxy or a service in a Kubernetes cluster. Follow these steps whether you intend to deploy Edge Microgateway as a service or a sidecar proxy. The minimum requirements for your Kubernetes cluster. How to install and configure Edge Microgateway. How to install the base configuration of Edge Microgateway into your Kubernetes cluster. Note: The steps in this section are shown as an example where you install Kubernetes on Google Kubernetes Engine (GKE). You don't have to use GKE; for other Kubernetes installation options, see Kubernetes Setup. Kubernetes version 1.9 or higher. Kubernetes CLI kubectl v1.9 or greater. A cluster with at least 3 nodes having 2 vCPUs each. Note: The following steps are offered as an example only. You do not have to use GKE for your Kubernetes installation. For other options for installing Kubernetes, see Kubernetes Setup. The Kubernetes administration machine is your local machine that you use to run commands against your Kubernetes cluster. This machine is typically a desktop machine that has access to your Kubernetes VMs. Install the kubectl command line interface 1.9 or later. (GKE only) Install gcloud if you are running Kubernetes on GKE. 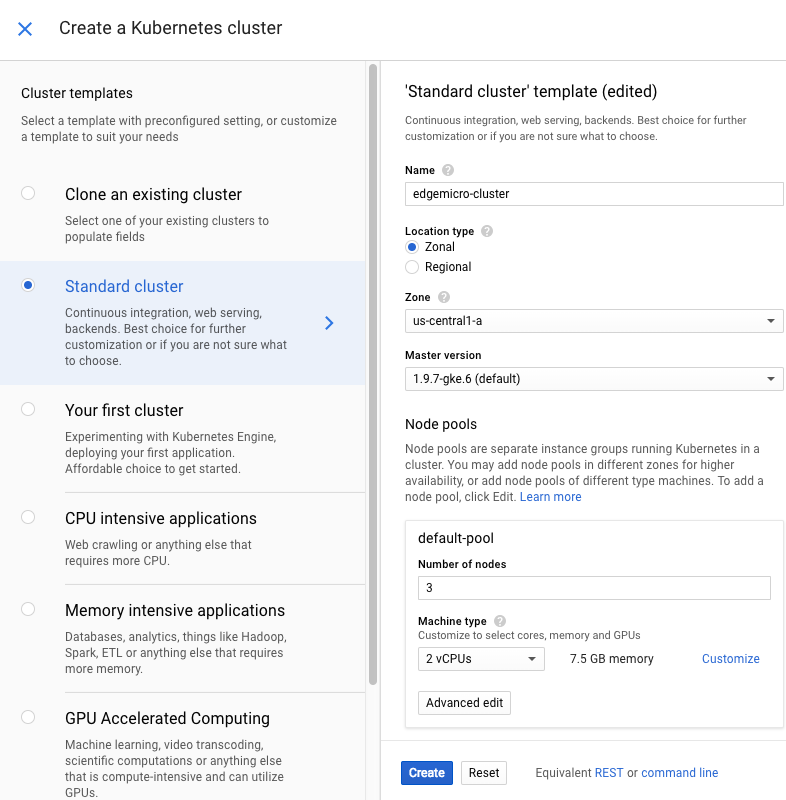 Log in to the Google Kubernetes Engine (GKE) dashboard on Google Cloud Platform (GCP). Select Cluster Version 1.9.7-gke-*. For example 1.9.7-gke.6. Select a size of 3 nodes. Select 2 vCPUs with 7.5 GB memory. cluster-name is the name of the Kubernetes cluster you created. zone is the zone where your cluster is located. project-name is your GCP project name. Download Edge Microgateway for Kubernetes. If you are on a MacOS or Linux machine, you can download the latest version or a particular version by specifying the version name. /install/kubernetes - Configuration .yaml files for deployment to Kubernetes. /samples - Sample applications for testing your installation. /bin - The edgemicroctl executable. The edgemicroctl command injects Edge Microgateway into Kubernetes as a sidecar gateway or a service. Apply the base Edge Microgateway setup to the Kubernetes cluster. The following command creates an edgemicro-system namespace and cluster roles for both the sidecar and service deployments. Install the Nginx Ingress controller into the cluster. Be sure that no other Nginix controller is running. You can check by running kubectl get pods. Note: You only need to install an ingress controller if you are exposing Edge Microgateway to consumers outside the cluster. If you are exposing the microgateway externally, you can use any ingress controller you wish. Nginx is used here as an example only. As the following sample output shows, it takes a minute or two for the processes to start. It is normal to see several Error and Restart cycles before the STATUS changes to Running. Once the Ingress is running, you can cancel the above command by typing Ctrl+C. If you need additional help, see Installing Edge Microgateway. If you are deploying the gateway as a service, see Deploy Edge Microgateway as a service. If you are deploying the gateway as a sidecar proxy, see Deploy Edge Microgateway as a sidecar proxy.